Solid/Stranded (ATC/ABC) Copper conductor, insulated with specially formulated PVC/TPE/XLPE to form a core. Cores laid up together or twisted to form a pair/triad depending upon the individual requirement. Such cores/pairs/triads after laying are coated with special Fire Resistant materials and overall sheathed with special PVC/TPE/LSZH. Shielding with Braiding/Aluminium Mylar taping will be done overall or individually depending upon the requirement. Armouring provided depending upon requirement with a extruded inner special PVC/TPE sheath, and overall sheath of special PVC/TPE. In order to fulfill the demands of our clients, we are able to offer premium quality Fire Survival Cables. The offered cables are fireproof as these are insulated with PVC/TPE/LSZH materials, which maintain circuit integrity even during extreme temperature. Modern manufacturing techniques are adopted in our huge infrastructure facility to manufacture these cables. These Fire Survival Cables are carefully tested as per IEC-60331 standards to meet the industry laid parameters. Shall be as per cable type Control/Instrumentation Signal/Thermocouple Extn./Compensating as per their respective features list. Will withstand Flame temperature of 750 degree centigrade upto 3 hours without electrical breakdown at rated voltage. Does not produce noxious smoke & fumes which hinder fire fighting and endanger life. © Copyright 2012. 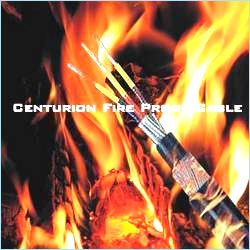 Centurion Power Cables Pvt. Ltd.